The ultimate goal of documenting and assessing land management practices is to share and spread valuable knowledge in land management, support evidence-based decision-making, and scale up identified good/ best practices. To achieve this, it is important to analyse field experiences and gain a better understanding of the reasons behind successful SLM practices, regardless of whether they were introduced by projects or whether they are found in traditional systems. WOCAT focuses on efforts to prevent and reduce land degradation and restore degraded land through improved land management technologies and approaches to implement these. All practices may be considered, whether they are traditional or indigenous, newly introduced through projects or programmes, adopted and/ or adapted by land users, or recent innovations. 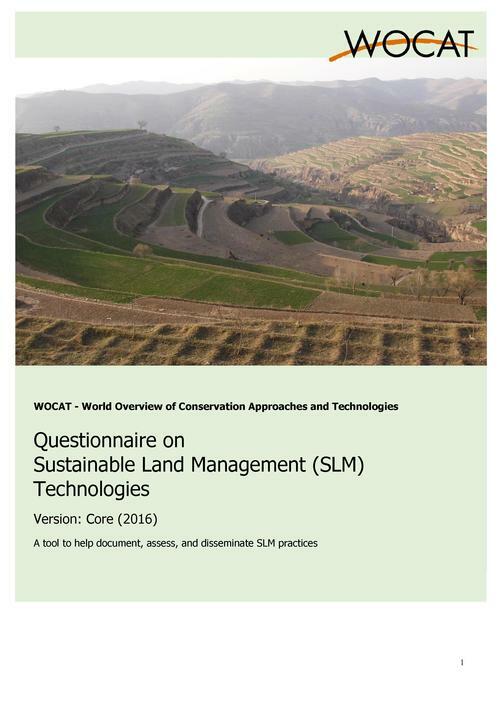 The Core Questionnaire on SLM Technologies (QT) helps to describe and understand the land management practice by addressing the following questions: what are the specifications of the Technology, what are the inputs and costs, where is it used (natural and human environment), and what impact does it have? Sustainable Land Management (SLM) in the context of WOCAT is defined as the use of land resources – including soils, water, vegetation, and animals – to produce goods and provide services to meet changing human needs, while simultaneously ensuring the long-term productive potential of these resources and the maintenance of their environmental functions. An SLM Technology is a physical practice in the field that controls land degradation and/ or enhances productivity. A Technology consists of one or several measures, such as agronomic, vegetative, structural, and management measures. Feelf ree to discuss the use and give your suggestions to this questionnaire in the discussion section of this portal. This page was last modified on 3 May 2017, at 17:02. This page has been accessed 3,234 times.